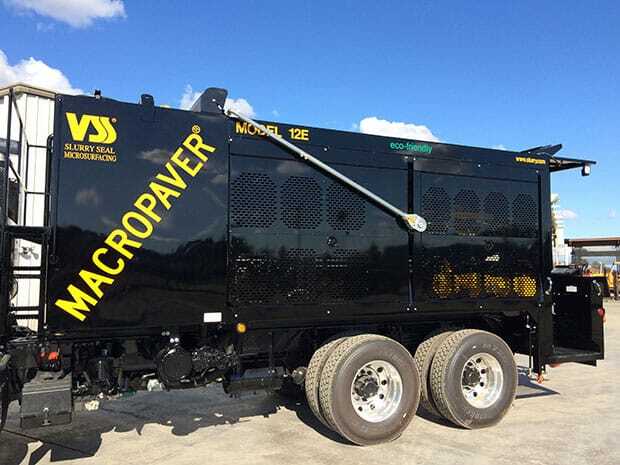 The VSS truck-mounted Macropaver® 12D has gained a world-wide reputation for flexibility, high production and low-cost performance. 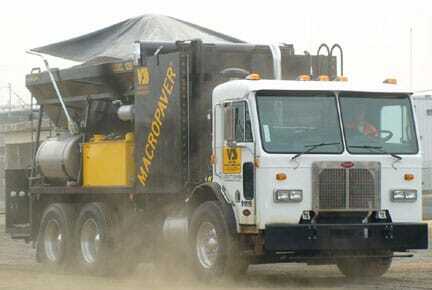 The Macropaver® 12D applies all slurry and polymer-modified micro surfacings with equal ease. 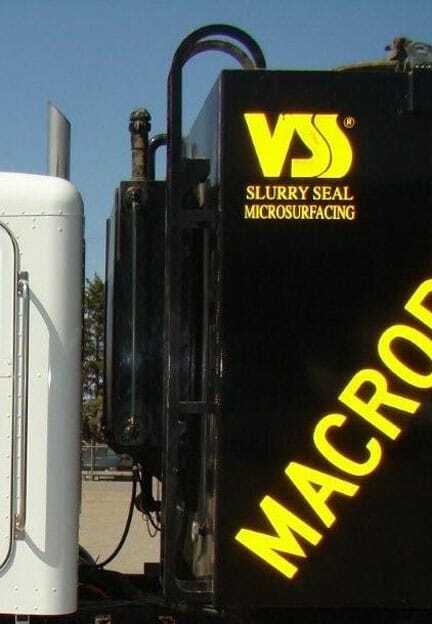 With over 60 years as a pavement maintenance contractor, VSS has introduced more people to the Slurry Seal and Micro Surfacing business than any other company. Equipped with the New EZ-OP Monitoring System, the 2016 Macropaver® 12D has made it even simpler to train new operators by eliminating manual calculations with intuitive controls. Consistent quality is accomplished throughout the production with automatic sequencing. 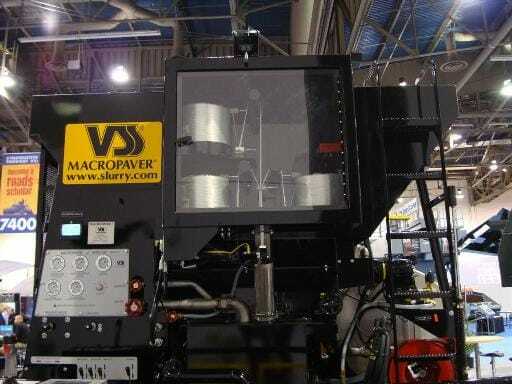 The Macropaver® 12D can easily double the application rates of competitive conventional machines, with average outputs of 2.7 – 3.6 tonne/min (3-4 tons/min). 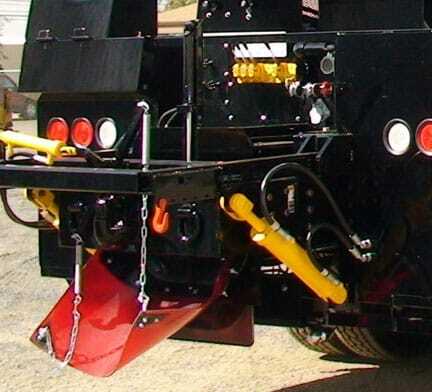 The Macropaver® 12D features the finest quality components and no chain or sprocket drives. Rugged and dependable performance has proven Macropavers® superior reliability, ease of operation and productivity. This system includes all of the features of the standard panel plus has several additional useful functions. The system can monitor Conveyer Slip Ratio (the timing between the head pulley and the tail pulley and measures slippage between the two and automatically shuts down the conveyer belt if too much slippage is registered). The emulsion tank and aggregate hopper also have safety shut down systems that will stop the production of slurry if they fail to register material flows. All three systems have warning lights with push buttons, which allow the alarm to be shut off during calibration or in case of a malfunction. The emulsion tank and water tank levels are displayed on the computer display. This system also has a calibration mode, which allows it to be preset for a determined number of revolutions for aggregate, emulsion and fines counts and have the unit stop at that number. The CalTrans system also monitors ground travel and when the spreader box width is input into the computer, the production rate and spread rate can be displayed, as well as displaying an average distance remaining per load. In addition, the computer provides automatic maintenance indications based upon filter condition and engine hours. To comply with CalTrans specifications a separate display is provided that can be viewed from the ground next to the machine that displays material usage and shutdown alarms. 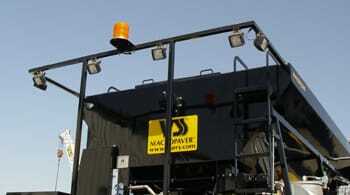 This is a warning strobe light, which is mounted to the top rear of the Macropaver. It consists of one (1) amber colored 360° rotating flashing light and it includes an on/off switch mounted at the operator control station. This package is used for providing a visual safety warning for slurry / microsurfacing operations during the day or at night. This feature is used where tarping your load/aggregate is mandatory and/or used where environmental issues are now becoming tickets. 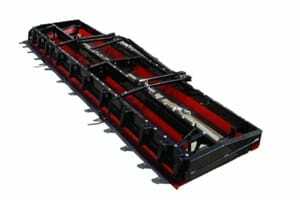 It consists of an electric arm/spring loaded mechanism that allows the tarp to unroll itself over the aggregate load and then roll closed via electric winch system. Unit comes complete with arms, springs, motor, dash panel, safety breakers, and power indicator light. 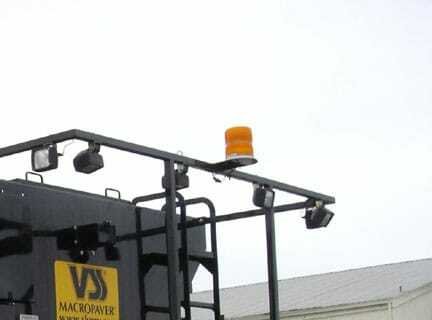 No need for operator/truck driver to climb on top of machine, this unit is controlled from the front of the Macropaver, with the flip of a switch. 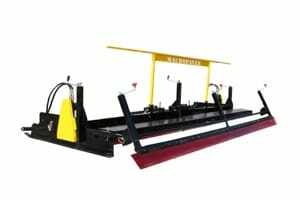 This system for the Macropaver provides a fiber chopper, fiber storage and control systems for injecting fibers into the slurry or microsurfacing mix. Provides for up to 8 lbs./min. (3.6 kg/min.) fiber injection. The chopper cuts from 1 to 4 strands of fiberglass into 1/4" - 1/2" (6mm - 12mm) long pieces and feeds them into the aggregate as it enters the inlet hopper. The system turns on and off with Main Start. 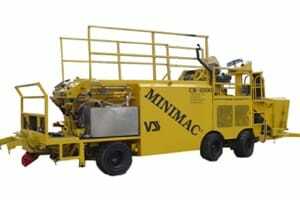 It is powered by the Macropaver main hydraulic sytem. 150-gallon (565 liter) stainless steel tank connected to main water pump for water supply to dilute additive. Additive pump is stainless steel, driven hydraulically for a maximum delivery capacity of 15 gallons (57 liters) per minute. Also includes electronic flow meter as part of the computer display and is automatically sequenced to production start/stop. This option consists of a high-pressure water pump developing 1500 PSI. 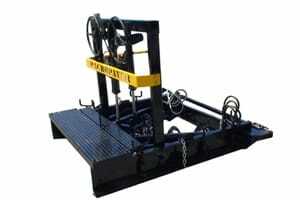 It is powered by the Macropaver’s main hydraulic system and comes with 25' (7.6m)of high-pressure hose, recoil reel and hand spray wand. With a flip of a switch, the high-pressure washer is ready to use. The washer will start and stop when the trigger is pulled or released. Two (2) lockable, hinged side covers for the engine / hydraulic components. Covers are made of laser-cut and formed panels and come with double-pin latching arms and key style lock mechanism on each door. Lower doors include steps for maintenance access to the Macropaver. Upper doors utilize air springs to hold doors up and out of the way, allowing for access and open work area. This system is designed and used with safety in mind. Consists of a color 18cm (7”) monitor connected to a small camera located in the rear of the machine. The camera is enclosed in vandal proof heavy-duty enclosure with a lockable steel cover. 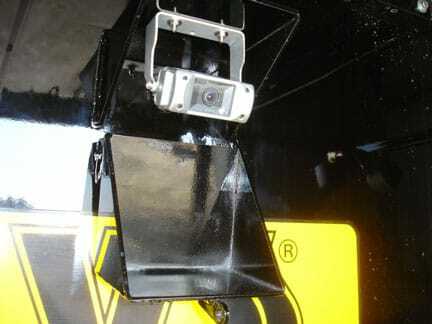 The camera allows the driver to “see” the entire work area, including the location of personnel on the ground behind the machine. It also allows the driver to “hear” the operator via a built-in microphone in the camera and a speaker in the monitor. This allows for the Macropaver to spray emulsion through a distribution bar placed just ahead of pugmill outlet. 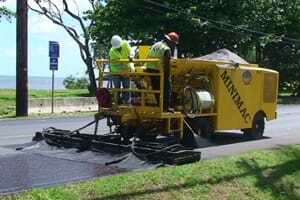 This provides for application of tack coat to the pavement surface prior to placing slurry or microsurfacing. 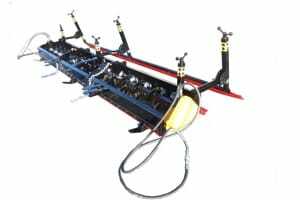 Basic Spray Bar Attachment has 8' (2.4m) width center section and two each 3' (0.9m) width attachable extensions. Each one of the sections has nozzles on 4" (10cm) centers. Spray width is adjustable "on the fly" in 12" (30cm) increments with pneumatic cylinder actuation. 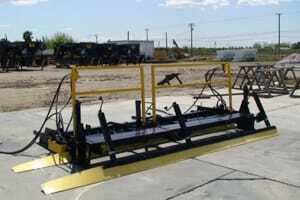 The bar is equipped with hydraulically actuated height and centering control. 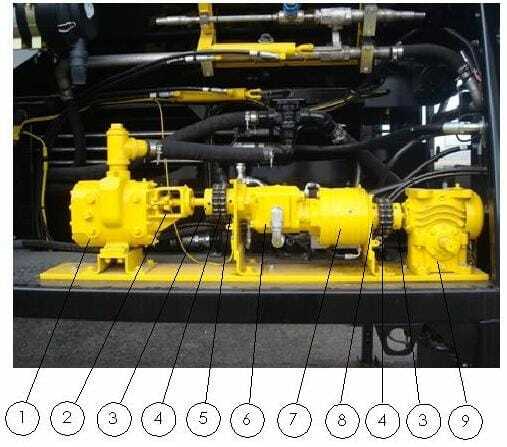 Emulsion pump is hydraulically driven with separate PTO driven hydraulic system. Pump output is approx. 60 gallons (225 liters) per minute. 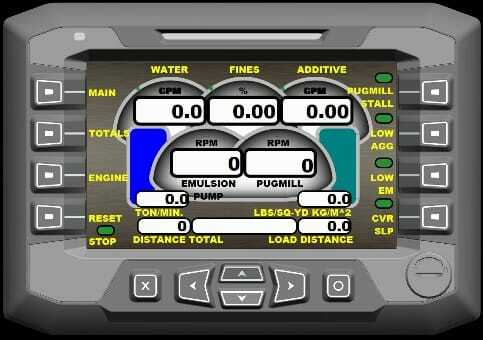 Emulsion flow rate and spread rate is controlled automatically with computerized rate control system. 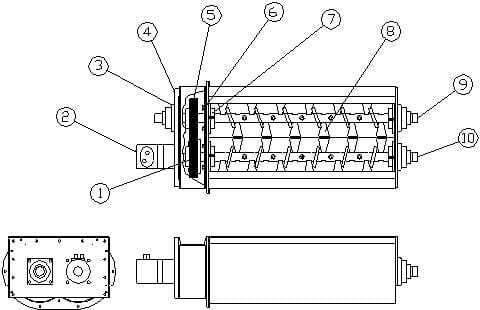 Emulsion material hook-ups are provided with hose and quick connectors. Operator controls all functions from the rear platform. Pugmill is equipped with a hydraulic cylinder actuated at operator control panel for the opening/closing of gate located at rear of pugmill. 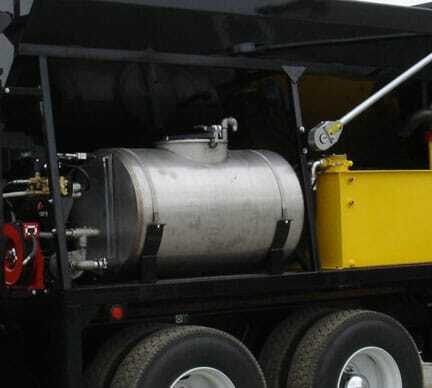 This allows for either the holding back of materials when working in small confined areas and/or for completely shutting off the flow of slurry materials when crossing over concrete or other related surfaces in which material “dripping” is a factor (primarily in residential areas). 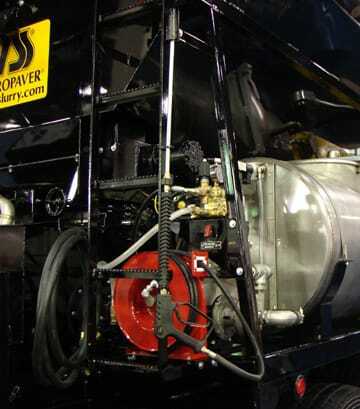 The rubber diverter directs material flow to either side of the slurry box. It is also hydraulically driven and the operator controls which direction the material flows. This is a 3” (7.62cm), 3-way, Teflon inserted asphalt valve that directs material flow control at the machine’s emulsion tank. It allows for manual selection of fluid direction. It controls flow from a) tank to pump, b) outside pump source to load tank, and c) self-load mode with one three position valve and handle. This is a light system mounted on steel tubing, which is mounted to the back of the Macropaver. It consists of six (6) halogen lights mounted above the operator and designed to direct light at various angles to “light up” the slurry box application area directly behind the machine. 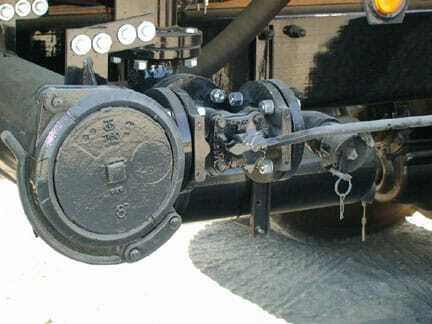 This package is used for applying slurry / microsurfacing at night, and can be utilized to act as a framework for adding a shade area and protect operator from direct sunlight in areas where extreme heat is a working factor. 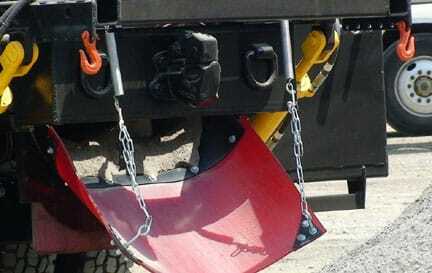 For trucks that do not have step fuel tank(s) (i.e. Cab Overs) or for when more fuel capacity is desired. 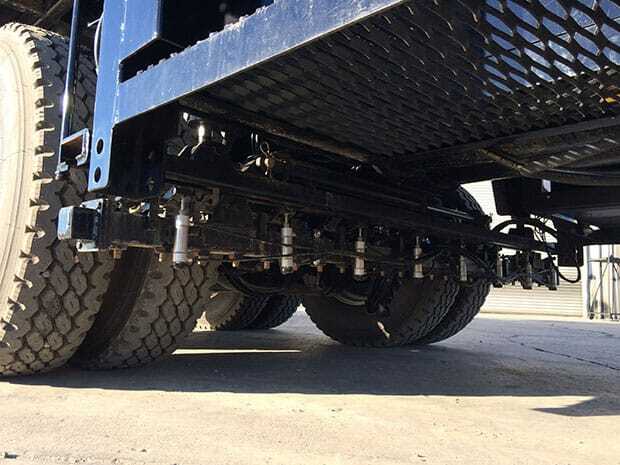 Consists of 10 gage steel tank, mounted to the front of the Macropaver, between the cab and the front of the Macropaver unit. 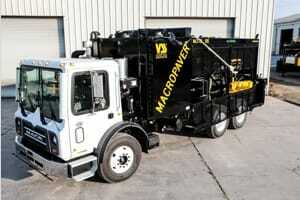 It has a 90-gallon (340 liter) capacity for fuel that feeds the truck as well as the Macropaver engine. All necessary plumbing and valving included. 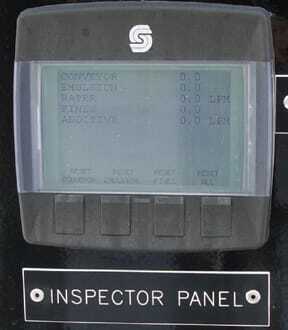 The Macropaver Telematics Option provides access to real time operation and GPS information via a web portal. 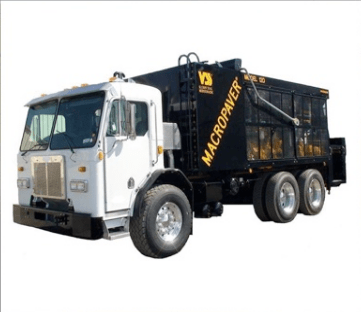 Customers can create customized scheduled reports that will keep them informed of their Macropaver's operating conditions and location without having to leave the office. The web portal also includes geofencing capability. 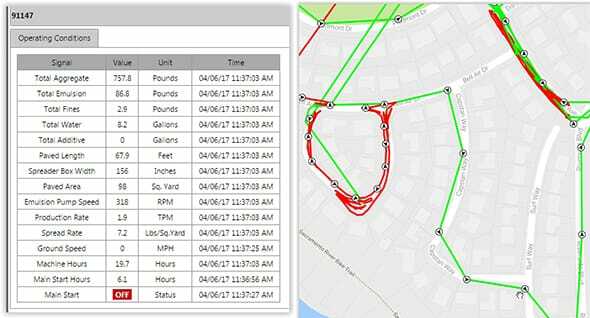 With the machine tracking feature, you can see where the machine was at any time and verify the amount of material that was placed at specific locations.